I know Mom Jeans are usually not as flattering as we think they are but they are making a comeback. 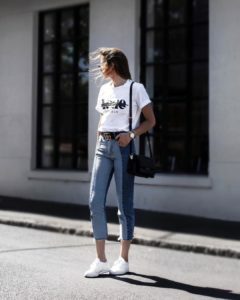 As an alternate style to boyfriend jeans, the mom jeans fit wider by the hips and are tapered by the ankle. 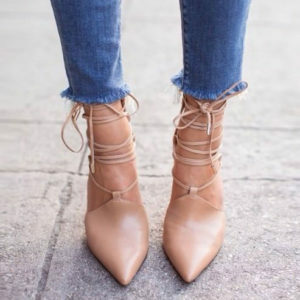 Try them in a light wash with a basic white tee for that effortless spring look. Try something new. White jeans can brighten up your look for spring. Reverse your style of wearing black jeans and a white tee to white jeans and a black tee. It’s an effortless and minimal go to look. It’s all about the raw hem on jeans this season. It can be on wide legged jeans to cropped denim. They add an edgy look to your jeans without going overboard. Remember, when it comes to jeans, it’s all in the details. Why choose one colour of denim to wear when you can have two? Two tone jeans will add dimension to your bottom and can be dressed up or down for all occasions. When embroidered jeans make a statement in your wardrobe, you make it work. Popular designs include red roses, tigers and stars. As a statement on their own, pair it with a simple top and your favourite shoes.